Lighthouses date all the way back to 285 B.C., a time when Pharaohs ruled in Egypt, Ancient Greece was thriving and the Zhao Dynasty was just coming into power in China. Before hundred-foot towers were constructed to guide fishermen and their boats into the harbor, large fires were created on platforms atop the highest hills surrounding the ports. The fires that functioned as lighthouses during this time acted much more like an entrance marker to the ports, rather than warning signals for upcoming danger. One of the first lighthouses ever built was the Pharos of Alexandria. Constructed by the Egyptians in 285 B.C. it stood on an island just outside the entrance of Alexandria. It towered 440 feet into the air, stood tall for 1,500 years and noted as one of the Seven Wonders of the Ancient World until it was destroyed by an earthquake in A.D. 1303. At this point in time, watchtower keepers were still using fire as the mechanism to signal and guide boats. At the turn of the 17th century, as sea travel in America became increasingly popular, beacons were being assembled in every major coastal city. Lighthouses were no longer being used just to guide boats into the harbors, but were now essential for the safety of fishermen and their crews. In 1716 the first lighthouse was built in the United States. It was erected on Little Brewster Island off the coast of Boston. Over the course of the next 50 years New Jersey was slowly but surely becoming a sprawling coastal state in its own right. Settlers were quickly building homes and small towns along the coast and taking advantage of the state’s 1,792 miles of shoreline and easy access to the waterways. As early as 1679, petitions were being made to build a watchtower at the tip of Sandy Hook, N.J. in order to safely guide fishermen into the New York Harbor. These petitions were not taken seriously, however, until a series of shipwrecks occurred in the very beginning of 1761. Over 80 years later, at the expense of hundreds of lives and thousands of pounds of material, forty-three prominent New Yorkers successfully petitioned to have a lighthouse manufactured on Sandy Hook to mark the entrance of the New York Harbor. On May 10, 1762 four New York merchants signed the deed to the land the lighthouse sits on and Mr. Isaac Conro, a mason, builder and seller, began his plans to erect the tower. Construction lasted for several years and even had to be put on hold for six months when the initial funding ran out. 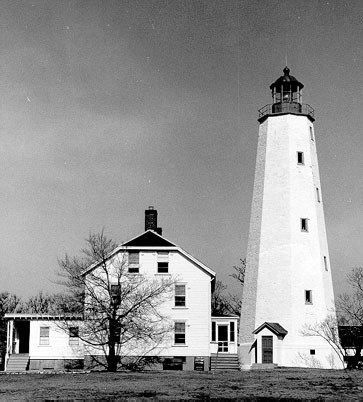 Mr. Conro’s goal for the Sandy Hook Lighthouse was to make it the most modern on the East Coast. Rather than fire, he used oil lamps to illuminate New Jersey’s first beacon. Beginning with the Sandy Hook Lighthouse, 18th century lodestars shifted from fire as the source of light to copper lamps filled with whale oil, which burned longer and brighter. In the spring of 1764 the Sandy Hook Lighthouse was finally complete and the lighting ceremony took place on June 18, 1764. Since the completion of the Sandy Hook Lighthouse, which still stands tall today, 25 lighthouses have been constructed up and down the coast of New Jersey. Although almost all of those have been destroyed, demolished or closed, each one played a significant part in the coastal history of the state. The Sandy Hook Lighthouse was the very beginning of what was to become a quite colorful history for New Jersey’s coast. Today, 11 lighthouses still dot the shoreline. From Cape May all the way up to the Atlantic Highlands, you can still see the significance lighthouses had on the state’s unique coastal history. For 67 years, the Sandy Hook Lighthouse was the only indicator that the New York Harbor was approaching. In fact, it was the only indicator that New Jersey was just a few hundred nautical miles away. It wasn’t until the turn of the 19th century that state lawmakers and workers in the shipping industry decided it was high time for a new guidepost to be constructed, this time about eight nautical miles south of New Jersey’s first lighthouse. A proposal for the Twin Rivers Lighthouse was presented to Congress in the early 1820s and it was complete in 1828. When the Twin Rivers Lighthouse was first built oil lamps were still the main source of light emanating from these magnificent structures. Then, in 1841, almost 15 years after its construction, the Twin Rivers Lighthouse became the first lighthouse in the United States to have its lighting composition completely modernized with the installation of the Fresnel lens. Before the Fresnel lens, a lens had to be extremely thick and heavy in order to produce the light intensity needed to signal ships. The Fresnel lens allowed even the smallest heliograph could produce that “big-lighthouse” beam. The Twin Rivers Lighthouse became a landmark, not only for the United States, but especially for New Jersey. In 1862 it was the first U.S. lighthouse to get a complete makeover, which cost an estimated $74,000, almost $1.6 million in today’s money! It also became the site of the first official reading of the Pledge of Allegiance in 1893. The installation of the Liberty Pole during that same year made the Twin Rivers Lighthouse a site seen by millions of immigrants as their ships headed toward Ellis Island. In 1898 it became the first electrically powered lighthouse with the installation of another new lens, one that required an on-site generator and in 1899, Guglielmo Marconi set up and tested his wireless telegraph here. In a sense, the Twin Rivers Lighthouse became the founding father of all modern beacons popping up on the coastal shores of New Jersey and beyond. Unlike the Sandy Hook and Twin Rivers lighthouses, it only took another twenty years before a third lighthouse on the New Jersey shore was put up. In 1848 one had to be built farther down the coast on Tucker’s Island in order to guide traffic into Little Egg Harbor. Unfortunately, Tucker’s Island Light did not gain as much notoriety as the ones previously constructed and seemed doomed from the start. A fixed red light was installed with 15 lamps surrounding the structure to signal and warn the ships coming into harbor. Many captains approaching shore called the flash of light a “distraction,” rather than a guide. In 1855, after the discovery of the Fresnel lens, a small, fourth-order Fresnel lens was installed with the hopes of improving visibility for incoming boats. Rather than a fixed white light, this new lens alternated between red and white flashes of light. Unfortunately, this change did not make any difference to the unsatisfied captains docking in the area and the lighthouse was discontinued late summer of 1859. The structure remained uninhabited for eight years until the Lighthouse Board decided to reestablish it under the new name Tucker’s Beach Lighthouse, this time with a complete makeover. In 1871 the tower was repainted so captains could see the structure better and the keeper’s building was expanded. Most importantly, the pattern of the light was changed to fixed white for one minute, followed by six red flashes for one minute and continuing with this pattern. After the renovation the lighthouse seemed to be booming; complaints were at an all-time low and it seemed Little Egg Harbor finally established the watchtower it had needed for the past 23 years. Unfortunately, Mother Nature acts on her on whim and for the next 80 years a series of events unfolded that wiped out not only Tucker’s Beach Lighthouse, but the entire island completely. Today, all that remains of a once thriving harbor is Tuckerton Seaport and a re-creation of Tucker’s Island Lighthouse, established and created in the 1980s by a group of Southern Ocean County maritime supporters. Just one year after the initial construction of Tucker’s Beach Lighthouse, East Point Lighthouse was built in Heislerville, N.J. at the entrance of the Maurice River in Cumberland County. Unlike the previously constructed lighthouses in the state, the East Point Lighthouse has quite a bleak and uneventful history. It was maintained by several innkeepers from September 1849 until December 1941, at which point it was decommissioned. Once the structure was blacked out, deterioration quickly set in. It sat untouched until 1955 when the Federal Government tried to sell it to a Long Island construction company. The sale ended when it was discovered that the property had never been offered to the State of New Jersey. In early 1971 the Maurice River Historical Society was founded with the hopes of restoring the lighthouse, unfortunately in July 1971 the building was set on fire and much of it was destroyed. Throughout the years since the fire several historic trust groups have slowly begun renovating it. Today, it is open to the public for visitors periodically throughout the year and efforts are still being made for a full restoration of a beautiful landmark lighthouse in Cumberland County. Dr. Jonathan Pitney, known as the father of Atlantic City, spent 10 years petitioning a lighthouse to be built in Atlantic City. In 1854 Congress approved his petition and construction began early 1855. 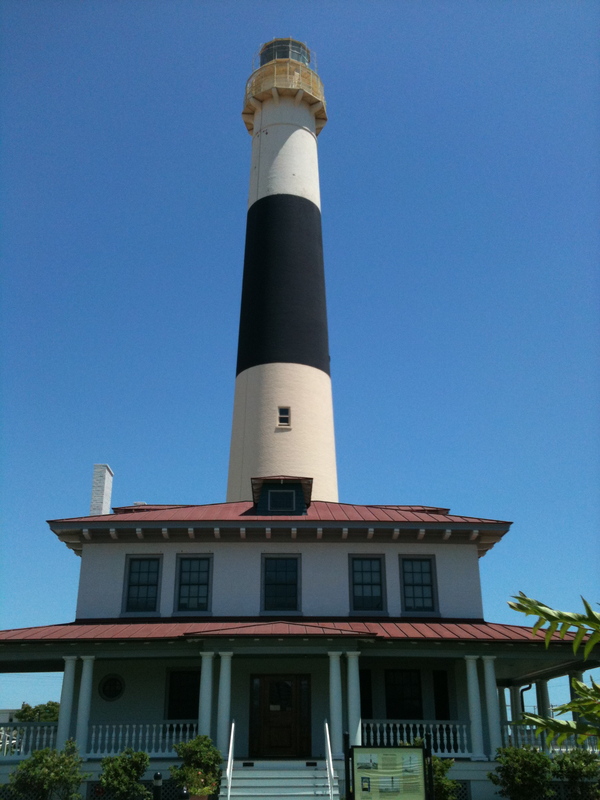 On Jan. 15, 1857 the Absecon Lighthouse was lit for the first time using a kerosene flame focused through a 36-plate, first-order Fresnel lens. Unlike the other Fresnel lenses used throughout New Jersey’s watchtowers, the one for the Absecon Lighthouse was specifically made and manufactured in Paris. The light could be seen 19.5 nautical miles out to sea, a huge feat for a beacon at that time. It was not only due to the powerful light that its beam was able to stretch so far, but it was also due to the massive size of the structure. This lighthouse towered 171 feet into the air and was equipped with 228 spiral stairs that led all the way to the top. Since its opening, it became the most popular tourist attraction in the area. In 1912, over 10,000 people were logged into the visitors book and in 1922, the Lighthouse Service noted the Absecon Lighthouse was “visited by the public more than any other lighthouse in the United States” (LighthouseFriends.com). 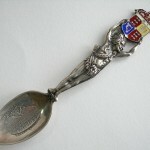 Just 10 years later it was discontinued by the Coast Guard. Atlantic City took control of the building in 1946 in order to save it from destruction. It was not reopened to the public for more than 30 years, after a full restoration had taken place for public safety. Today, it is still one of the most popular attractions in Atlantic City. The Barnegat Lighthouse that stands today, better known as Old Barney by the locals, was the second structure built within a 20 year period on the island. The first stood only 40 feet high and like many lighthouses constructed in the beginning of the 1800s, sailors and captains found the light both distracting and inadequate for safe travels and docking. Due to the area’s high coastal traffic coming to and from New York, it was crucial to build an efficient guidepost to safely direct the boats. The new, larger and much-improved lighthouse stood 170 feet tall and featured a first-order Fresnel lens, which beamed 20 nautical miles off the coast. Old Barney was decommissioned in 1944, but always remained a landmark for locals and tourists. It was reopened to the public on Jan. 1, 2009, on the 150th anniversary of the first lighting of Old Barney, and is still open to the public for regular tours. Much like Old Barney, the Cape May Lighthouse that stands today was not the original structure, in fact, it is the third lighthouse manufactured in the same area. The first, built in 1823, lasted only 20 years until it succumbed to the rising tide and was eventually surrounded by water on all sides. The second, assembled 25 years later, stood 78-feet tall on a lot approximately 600 feet south of the original. Just four years after it was constructed an inspector noted its poor condition and ordered it to be shut down. Two additional acres of land were purchased 10 years later so a larger, proper lighthouse could be established in Cape May in order to mark the entrance of the Delaware Bay. 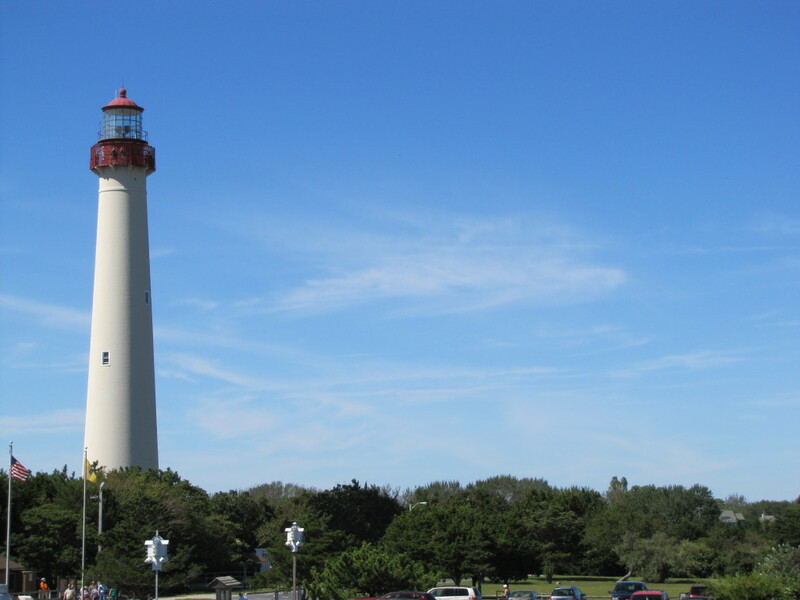 The third and final Cape May Lighthouse stands 157 feet tall and was equipped with a first-order, Henry-Lepaute Fresnel lens. The state-of-the-art lens featured 16 flash panels which rotated to produce a white flash of light every thirty seconds (lighthousefriends.com). The heliograph was lit for the first time on Halloween, 1859. From the time it was lit until the Fresnel lens was dismantled in 1946, the Cape May Lighthouse was headed by poor keepers and was never properly taken care of. In 1988 the Mid-Atlantic Center for the Arts leased the lighthouse, it has since been restored and is open to the public. A historic waterway, the Hereford Inlet has been a popular East Coast waterway since the 17th century. It was first used by whalers to haul in and butcher their catches, since then its traffic quickly increased to include boaters, sailors, fishermen and travelers. With the increase in traffic an obvious need for a Lighthouse arose. On June 10, 1872 Congress passed legislation to finance the purchase of land, a prominent position on the dune overlooking the approach to the Inlet. Construction began Nov. 8, 1873 and was completed March 30, 1874. The lighthouse stands 57 feet above sea level with a light visibility of 13 nautical miles. For 86 years, the Hereford Inlet Lighthouse operated as normal until the early 1960s when the Coast Guard automated the tower and it was closed. It was left to deteriorate for the next 18 years, until a restoration project began and it reopened in 1983. Today it is open for public tours and maintained by The Friends of Hereford Inlet Lighthouse, Inc. The Finn’s Point Rear Range Light and the Tinicum Rear Range Lighthouse are unlike any of the other lighthouses still standing today. Each of these structures is made completely out of wrought-iron, rather than brick or concrete, and lack separate housing for the keeper, which made them exceptionally more cost efficient. The edifices represent a classic example of a skeletal, prefabricated lighthouse. Finns Point Rear Range was originally assembled in Buffalo, N.Y. and transported to Pennsville, N.J. in early 1876. It was erected in 1876 and lit April 1877. Finns Point Rear Range stands 115 feet tall, is made out of wrought-iron and has an open-frame composition. The construction of the tower was necessary to help ships and vessels continue up the Delaware River, passing Reedy Island and Baker Shoal. It was equipped with a 24-inch lens with a double wick burner and kerosene vapor lamp which emitted 150,000 candlepower (visitnj.org). It was active until March 22, 1950. Tinicum Rear Range Light sits on land that was once the capital of New Sweden, in 1655. Just west of Philadelphia, the tower had a characteristic light pattern of two seconds on and one second off. The guidepost helped ships pass Tinicum Island and make their way upriver. As with Finns Point Rear Range, it too is made completely out of wrought-iron with an open-face structure. The light tower guided vessels from 1880 until 1933 when it was automated. Today, it still stands 109 feet tall and is available to visit. The final beacon constructed on the Jersey Shore was the Sea Girt Lighthouse located on what is now the Manasquan Inlet. The need of a watchtower in the area came out of a concern from the locals who felt some sort of light was necessary between the stretch of waters from the Barnegat Inlet to the south and Sandy Hook Bay to the north (njlhs.org). Construction began early 1896 and was completed in less than a year, making it the fastest lighthouse built in New Jersey. The lamps inside the Sea Girt Lighthouse were ignited for the first time on Dec. 10, 1896. In 1921, the Sea Girt Lighthouse became the first lighthouse equipped with a radio fog signal. The radio allowed any vessel equipped with a radio compass to detect the signals. Captain would coordinate the locations on a map and could then identify the station and sail for it more accurately. The Sea Girt Lighthouse was fully operational until 1955 when the cost to keep the tower modern became too high, as well as the change of shipping lanes moving to the east, caused the state to shut it down. In 1980 the Sea Girt Lighthouse Citizens Committee leased the property to restore and maintain it. Tours are available seasonally. By the middle of the 20th century, the decline of the use of lighthouses was prevalent up and down the East and West Coasts of the United States. The rapid development of electronic navigation systems directly led to the Coast Guard shutting down almost all of the heliographs on New Jersey’s coast. Captains no longer relied on the gleaming light to guide them into harbors and warn them of impending dangers. New technological advancements, sonar radar and electronic navigation systems became the new norm beginning in the 1950s. Because many lighthouses were state owned, once it was shut down there was no one to maintain the structure. Many of New Jersey’s lighthouses or lightships collapsed due to structural damage or were completely destroyed from years of weather damage. While a decimated lighthouse could easily be condemned, a lightship had to be left in the ocean to weather the storm on its own. The most notable example of an abandoned lightship in New Jersey is the Cross Ledge Lighthouse, constructed in 1875. It sits about 25 miles inside the Delaware Bay and its purpose was to signal boaters of the entrance. After only 35 years the watchtower was discontinued, however, it could not be removed from the water and was left to rot. What was created to aid ships into the bay immediately became a hazard to any ship sailing in the area after 1910. For the last 100 years no warning of the upcoming concrete protrusion has ever been built, and if hit dead on could easily capsize any vessel. Aimed at the restoration and preservation of lighthouses, community members came together to create organizations that raise money to ensure New Jersey’s beacons stand tall for years to come. They collect donations on-site during regular tour hours and from various events held annually. 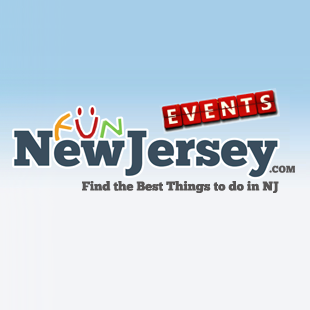 The most popular event is the Lighthouse Challenge of NJ, hosted on scheduled dates each year. The Lighthouse Challenge allows visitors to tour specific towers at unique times, such as during sunsets or at night time. 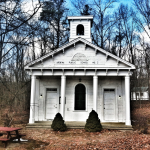 All proceeds from the event go to the preservation of these treasured landmarks. While none of the lighthouses in New Jersey function today as they did between the late 1700s through the early 1900s, the few left in the state represent a history, embody a way of living and symbolize 250 years of New Jersey’s coastal communities. For over two centuries, the construction of lighthouses ensured the safety of maritime travelers up and down the coast. Today, they are a majestic reminder of a culture that shaped so much of our state’s history. For a list of rainy day friendly lighthouses and more attractions, take a look at our definitive guide to indoor fun. Check out our NJ Beach Guide for all things to do up and down the shore!